This article will discuss two recently completed canine nutrition research studies. 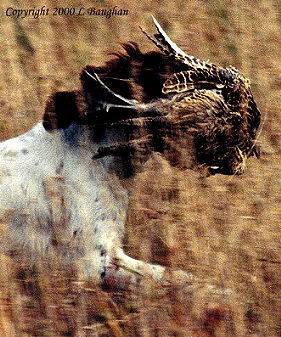 Both of the studies have direct application to the daily feeding of hunting dogs - of all breeds. The first nutritional trial, sponsored by the Nestle Purina Company, evaluated the effects of dietary restriction on health and longevity. The Iams Company performed the second nutritional trial which evaluated the effects of diet on hunting performance. Applying the findings of these studies to your dog’s feeding program will yield noticeable results. An initial review of some basic nutritional principles will be presented. Then the research studies will be presented, and the main findings that should benefit all working dogs will be discussed. There are six basic types of nutrients that are essential to the health of all animals: water, carbohydrates, proteins, fats, minerals, and vitamins. Water is essential for nearly all metabolic processes and for maintaining the structure of the body. A constant supply should be available at all times. Carbohydrates, proteins, and fats are all energy yielding nutrients but have other functions, as well. Carbohydrates serve primarily as a rapidly available source of energy for the body and, to a much lesser extent, as structural components in the body. Proteins are important building blocks for most of the structural elements of the body including: muscle, skin, and coat. Some proteins are broken down to be used as energy - although carbohydrates and fats are more important and efficient energy sources in normal metabolism. Dietary fats are an excellent source of energy. Because fats yield more energy on a weight basis than carbohydrates or proteins - and are more digestible, fats can provide two to three times as much energy as an equal amount of either carbohydrates or proteins. Minerals and vitamins are important as structural components of the body and are also needed for many metabolic functions. However, they are needed in much smaller quantities than the other nutrients.